This bottle was one of my purchases early in My Whisky Journey ™. I had just taken my car to get an oil change, which for some unexplained reason lasted north of an hour and a half. On the way out of the dealership, I opted to veer into the liquor store right next door. I was determined to pick out a nice Scotch, but really had no idea what to pick. While sitting in the dealership waiting room, avoiding their free donuts, I had stumbled across a listing of the awards given at the most recent San Francisco World Spirits Competition. Figuring that this was as good a resource as any, I took the award listing into the store and basically walked the whisky aisle, trying to figure out which bottles in stock were award winners. 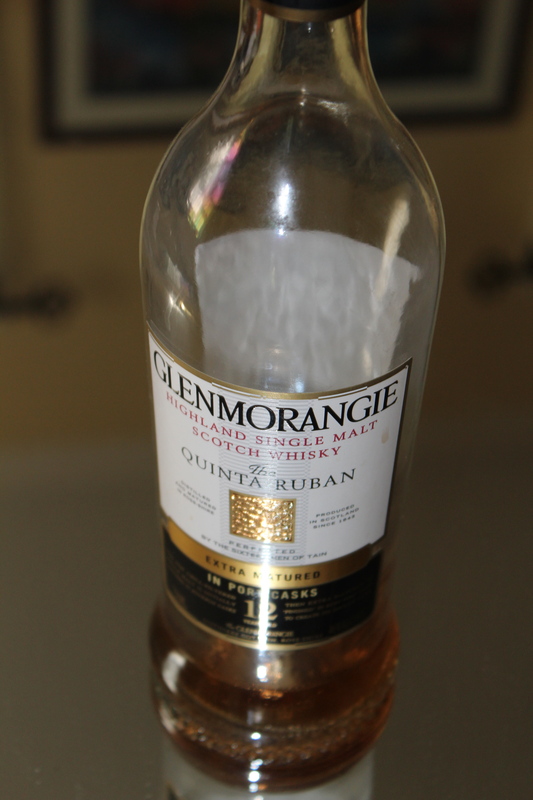 Eventually, I came across The Quinta Ruban from The Glenmorangie. The packaging looked all classy-like, and it was a gold medal winner! Which is like the third best medal you can win. Not bad. I Googled a couple of reviews, which were mostly positive, and pulled the trigger. While it is my policy to give virtually no information in my reviews, I’ll note that the Quinta Ruban is a 12 year old whisky that is finished in ruby port casks. It is part of their “Extra Matured” range, along with the Lasanta (Oloroso casks) and the Nectar D’Or (Sauternes). OK. Information over. 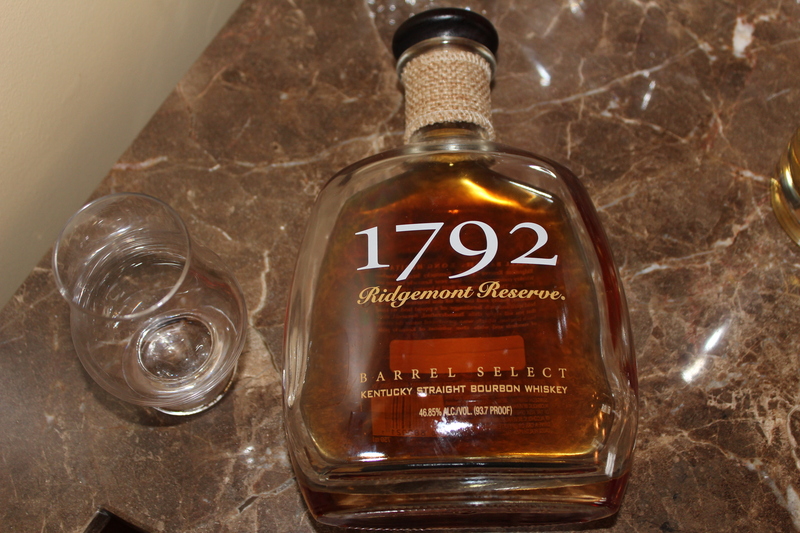 Nose – The nose starts out with significant wood and caramel sweetness, almost close to a Bourbon. I also get something like a corn muffin and some earthiness. That is some mix. Finishing up with peppery spice. And is that nutmeg? Taste – Rich and lip-smacking. I get a lot of dark fruit – cherries, raisins maybe? And, of course, you really get that taste of port in the back of your mouth. I’ve heard people talk about mint in this, but I totally don’t get it. Little Bitty Bits picks up a taste that reminds her of Brachs caramels. Finish – Shorter than expected. I find it interesting that the flavors tend to evaporate at the finish, leaving you with a (pleasant) heat. With a splash of water, I find that the Quinta Ruban doesn’t really show different flavors (as many whiskies do), but rather just becomes a bit smoother, which is perfectly tasty. Score – B+. As I said above, I bought this bottle awhile back. In its early stages, I wasn’t exactly tearing through it, but I was sort of trying to train myself to enjoy Scotch. When I got it down to about a quarter left, I made sure not to have any more without writing down my notes. Well, somehow, the bottle managed to sit untouched into April, when I picked it up with notebook in hand. What do you know, this time around, I was loving it. I think this was definitely a sign of palate evolution (a topic which I will touch on in some depth in my next review). That said, the few times I tasted the last quarter of the bottle, my score thoughts have been between an A- and a B-. It seems that this is really one that depends on my mood. Apologies for the lack of recent posts. I have no excuse. I’m lazy. Here’s hoping this post begins a run of regular posts. It’s no fun starting every post with an apology for lack of activity. Let’s move on. My next review is of a blended whisky from the good folks at Compass Box. At least I’m guessing that they are good folks. For whatever reason, I imagine that anyone involved in the whisky industry is a good person. Because they, in some small way, bring me joy. Anyhow, it seems that Compass Box is setting the interwebs on fire. A few months back, having recently read that the Whisky Advocate had named Compass Box’s Great King Street as their Blended Whisky of the Year, I figured that it was a worthwhile early Scotch purchase (especially with its sub-$40 price tag). So off I drove to a big, supermarket-type liquor store to pick up the GKS, and wouldn’t you know they don’t carry it. I did, however, spot the Compass Box Asyla and, too lazy to drive down the road to the next liquor store, did a quick iPhone search for Asyla reviews. After seeing a few positive writeups, I grabbed it and was on my way. Perhaps not the most scientific reasoning, but hey, things happen for a reason. Right? Right? Let’s go to the tasting notes. Nose – A nice light nose, and one whose flavors I found difficult to nail down. Honeyed apple sweetness, an herbal (grass? mint?) note, and a surprisingly robust alcohol heat that singes the nose hairs a bit (not that I have nose hairs – I wax). Taste – On the palate, I was again surprised that the heat hits first and is really a primary component of the taste. Also, less sweet then expected. Some juniper and a hint of vanilla. Very light-bodied and subtle. After 15 or 20 minutes exposed to the open air, it seems to loosen up a bit, becoming smoother with some of the sweet flavors being highlighted (including a taste of banana?). Finish – The finish remains rather dry, and gives a pleasant gentle warmness. In my opinion, not a whisky that benefits from a splash of water. Score – B-. It seems that this was just too light and delicate for me. I enjoy a nice light, honeyed dram as much as the next guy, but this was just too small. One other note – I had this bottle open for more than a full month before I wrote down my tasting notes. That is often the case, as I only bring out my notebook from time to time, and am usually just enjoying a leisurely drink. It seems that over the course of time, my appreciation for the Asyla faded. Early on, I quite enjoyed it, but by the time I wrote down my notes, it was too small/light for my tastes. Now, it could be that my tastes are changing rapidly (which they are, without question), but perhaps it could also be that the whisky changes after it has been open a while? I’ve seen other references on the whiskynets to this happening. But this is the only bottle that seemed to experience such a drastic change. What say you, whisky commenters? In the comments to my last post, a couple of you mentioned that I need not fear the big Islays. And truthfully, I don’t. I figure that loving Highland Park 12 and liking Talisker 10 puts me in a position where I can at least tolerate some of the “dark, peaty side,” as they say. This evening, I just so happened to find myself in front of the same selection of single malts described below. I thought to myself, “I do it all for my readers,” and gamely ordered the Lagavulin 16. Nose – Mmmmm … aaahhh … hey …. mmmmm. Finish – *sigh* I’ll have anoth– wait, it costs WHAT? So maybe it was a little pricy for regular ordering, but a bottle of that juice will be making its way into my cabinet, and soon. I think LBB will get the message that it just may be a good “birthday bottle,” if you know what I mean. Not unrelated to the above, I’m thinking my next bottle purchase will be a nice peaty plunge. What say you, dear readers, in terms of a favorite of the three big, peaty intro-Islays (as I see them): Ardbeg 10, Caol Ila 12 and Laphroaig 10 (or maybe Quarter Cask)? Favorites? The other day, Little Bitty Bits and I were at our local upscale pizza joint (the kind that serves individual pizzas with fancy toppings). The place has a little single malt selection that isn’t the worst ever – Glenlivet 12, Glenlivet 15, Glenmorangie Original, Macallan 12, Lagavulin 16 and the Bowmore Legend. Now, by this visit, I had tried each of those whiskies aside from the the last two. And from my reading up on whisky in the last few months, here is what I know about them: they are both Islays, the Lagavulin is beloved by many as a great peaty whisky, and the Legend is known for being one of the cheapest good whiskies around. Faced with this decision, you have to understand two things about me. First, I am a wimp. The murderer’s row of Laphroig, Ardbeg, Caol Ila and the like scare me. Well, they don’t scare me scare me. I just have a difficult time seeing myself enjoying something that people describe as having the taste of campfire. Second, I am cheap. Most of the other pours at this place had run me $9 or $10, and I was hoping to maybe give the wallet a slight break (in the end, though, I think they still charge $8.50 for the Legend). So as the post title shows, I went with the Legend. Here are my notes. They are short and sweet, because drinking this whisky is a pretty short and sweet experience. On the nose, this reminds me a lot of Johnny Walker Black – a little hit of smoke and some citrus-y sweetness in back. On the palate, it is very light bodied – almost watery. Again, you get a little puff of smoke and then a light taste of honey. Then the show’s over. Reading back, it sounds like I might have been a little too harsh. This is a pretty straightforward whisky, not a peat monster. And it easily passes my “are you pouring it down the drain” test. It is just … simple. But for $26 a bottle, I wouldn’t fault anyone on a budget for using it as their go-to Tuesday night sipper. My favorite part of blogging is when some of my visitors talk whisky in the comments. Almost to a person, they know more than me about the subject, so it is a great learning experience. So I’ll open it up to you – what are your picks for great whisky values? I’ll start with a few picks of my own. Two bottles that I quite enjoy for under $35 locally are Glenmorangie Original and Old Pulteney 12 (WW reviews both upcoming ) (and actually, if I had to settle on just one value bottle, OP12 might be the one). A couple of dollars higher, and I’m coming to realize that I am all about Highland Park 12 (at $41). For another data point, we can look to Ryan’s Value Whiskey Reviews. For his highest value rating, he also lists the Highland Park 12, and also highlights Talisker $10, at $48 per. What say you, good readers? A quick note to update my dear readership on my travails in the case of the Jameson bottle switcharoo. Well, on her next visit to the liquor store in question, Little Bitty Bits gently mentioned what happened to the guy working there, carefully avoiding blaming the store or asking for any recompense. To his credit, the guy immediately told her to bring the bottle back in, and said that he’d tell the salesperson and see what he could do. Fast forward to this week, our next visit to that store, and as soon as we walked through the door, the gentleman working there hustled into the back room. He came out and explained that he spoke to the salesperson and was able to offer a trade: a bottle of Highland Park 12 with a torn label. While not quite an equal exchange in terms of price (in my hood, HP 12 goes for $3 less than Jameson 12), I was eager to accept that bottle. HP 12, as I noted earlier, was the whisky that really made me think that maybe, just maybe, there is something to this Scotch thing. And in the months since I’ve finished that bottle, I know for a fact that my palate has changed significantly. So I’m eager to try this one again. Keep your eye out for that review. Speaking of upcoming reviews, it looks like the upcoming few will be Scotches – Compass Box Asyla, Glenmorangie Quinta Ruban, and Old Pulteney 12. Keep your eyes peeled for those. Finally, my latest purchase was the much-heralded Talisker 10. It is currently in the box, awaiting the kicking of one of its predecessors. I can’t wait to try it. Well, then. That was a nice little break, now wasn’t it? Sorry for the radio silence. Life got in the way a bit, but I’m glad to say that I’m back at it, pouring brown liquids down the hatch and letting you know what I think. Today’s topic? Kentucky straight bourbon whiskey. Two iterations, in fact (I’m blogging so slowly that I’m falling behind my drinking, hence the doubling up). You see, I was watching the Final Four and the national championship game, witnessing the utter dominance of Anthony Davis and his freakishly talented teammates, and I figured that now is as good a time as any to highlight some Kentucky juice. Before I get to the tasting, a word on Calipari & Co. The Wildcats were an amazing team, they played hard, they played the game right, and they were absolutely deserving of the title. But I think that Green Bay Packers Tight End Tom Crabtree (@TCrabtree83) put it best when, with Kansas trailing toward the end of the game, he Tweeted: “Kansas can either comeback and win this thing now, or win it in 3-5 years when Kentucky is forced to vacate it.” In other words, John Calipari, while a top recruiter, master motivator and a hell of an in-game coach, has the moral compass of a mug of bongwater. Both UMass and Memphis have had to vacate successful seasons from his time there, and it won’t be a surprise when Kentucky will have to do the same. Enough of that downer, though. In honor of Kentucky’s victory, and the upcoming Kentucky Derby, here are my tasting notes. Nose – Just lovely. I’m fond of so many bourbons on the nose, and this one doesn’t disappoint. Some green pepper/stony scent. Floral perfume. Wood chips. And some fruit – banana perhaps? I’d like this to be my cologne. Taste – Wow. This goes from sweet and quaint on the nose to a monster on the palate. Big, mouth-filling, puckering flavors. Very heavy on the oak. Licorice. I get almost no sweetness whatsoever. Something of a rye-type of flavor. Finish – Pretty long, and like I said, it infuses your entire mouth and nose with the flavor. Still that oak, but a hint of something like tobacco and just a whiff of lavender? Comment – An interesting whiskey. I know a lot of people are into it, but I’m learning that I really need that sweet note at some point, and I don’t get it here (which is somewhat strange, as I’ve read some other reviews describing it as overly sweet). Score – B-. Obviously not my favorite, but I can see how others enjoy it. To me, it was like taking a big bite of wood chips with a couple of flower petals mixed in. Nose – Again, a lot of oak and green pepper. Molasses and something like a latte. Singes the nose hairs a bit. 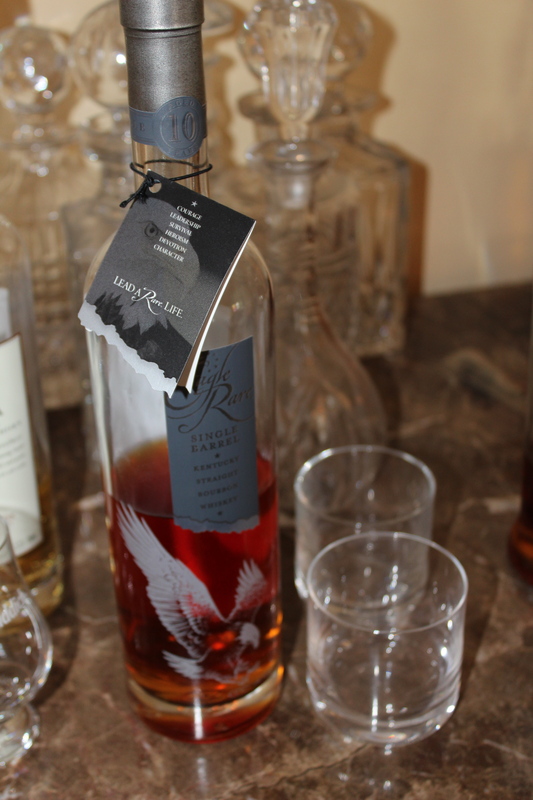 Taste – Starts with big oak right up front, then comes some brown sugar/creme brulee. Dark Chocolate and leather. Finish – While not the longest finish, it seems to be active. Things are happening in your mouth. Good things. Still with the wood, but also vanilla and a hint of lemon. Somewhat drying. Comment – Another big, mouth-filling whiskey. Not light or refreshing. Similar to the Ridgemont Reserve on the nose and with the huge oak on the palate, but differing in the considerable sweet flavors. Score – B+. Of the two bourbons, I obviously preferred this one, but it isn’t the type of whiskey that you’ll spend an afternoon sipping. Just a nice glass here and there for something interesting and somewhat different.